Above and below; A stunning pre spawn Pike in immaculate condition was very, ery welcome on the first session of the year afloat after Pike. The fish weighed 5.9kg (13lb. 2oz.). 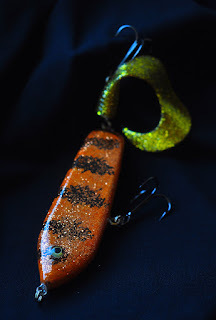 She took a small yellow Lunker City jig, with a 7g head, intended for Perch on the light rod combo, making for a hooped over, juddering fight on light gear. 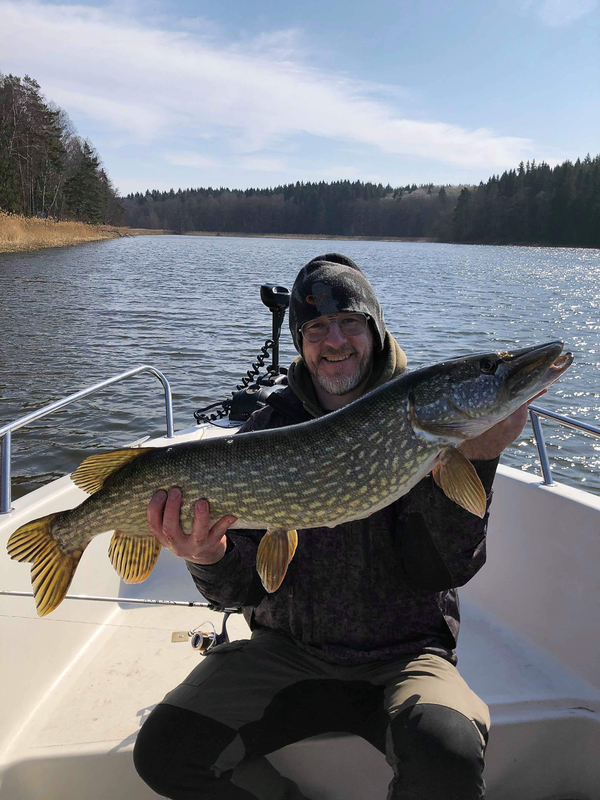 Whilst not a monster, a very good fish all the same and it certainly made my day after a long Swedish winter. A day afloat was arrangd with Eddie Bowler on the boat from Lidingö during the week and I had looked forward to it all week after a long Swedish winter. With the boat in the water and the area now ice free we were finally able to get out fishing. 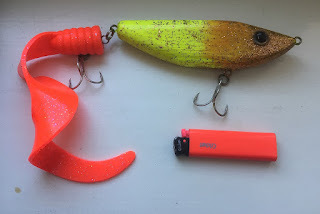 We set off at 11am and headed out to a favoured spot on the archipelago, where we began to fish for both Pike and Perch, alternating between lighter and heavier outfits. In the first hour we had several large Bream on the Perch jigs. The side scan on the fishfinder showed they were here in their thousands, big slabs resting along the reedbeds over a large area of water. I had another hit and initially though the culprit another Bream, though after a short while I began to wonder. The fish seemd quite heavy and was swimming around on the bottom, whilst the rod gave slow, deep pulls. 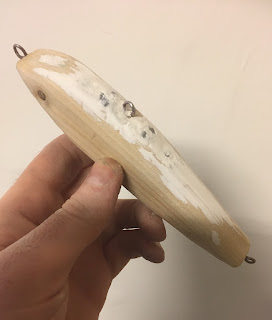 After a short while a tail broke the surface and the penny began to drop, despite the brief glimpse, I was now starting to wonder of this could be a decent Pike. I informed Ed to grab the net, who in turn was naturally convinced I was putting him on after all the Bream we had been having. I assured him I was not joking, he assured me I was. Then the fish came to the top, a few expletives echoed through the pines forests briefly, before Ed duly netted the fish. 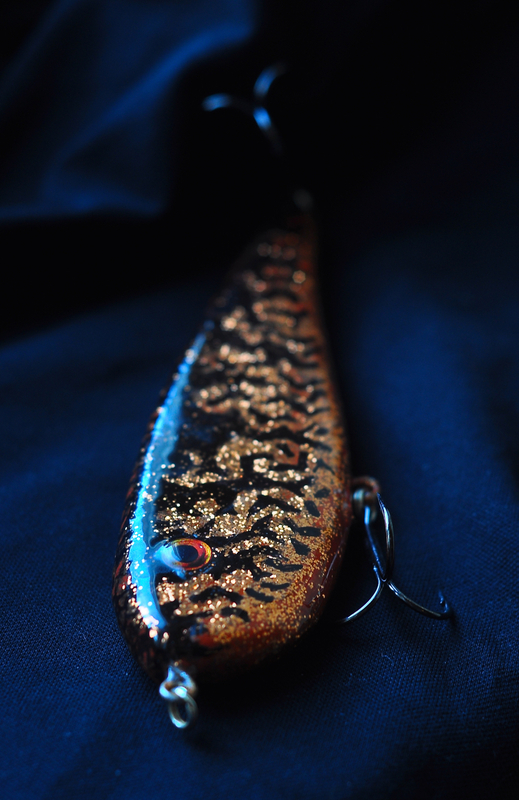 It was a stunning pre spawn Pike, in fantastic condition and it really did brighten our day. 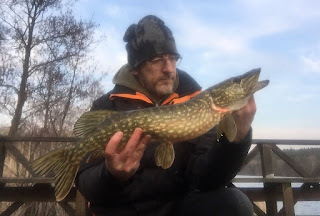 So this was the first Pike of 2019, caught on a short afterwork lure session close to Stockholm City. 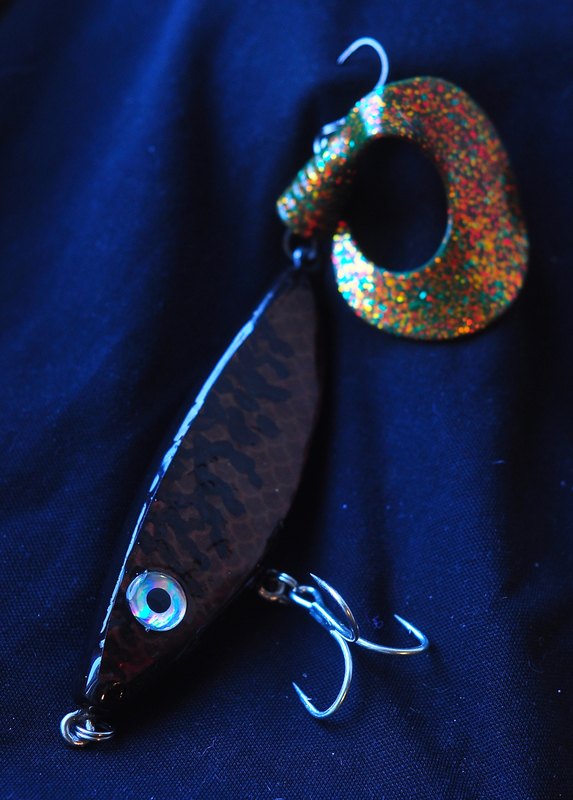 Small tailbait for shallow water, with silver holographic foil and motoroil McMio tail. Owner trebles. 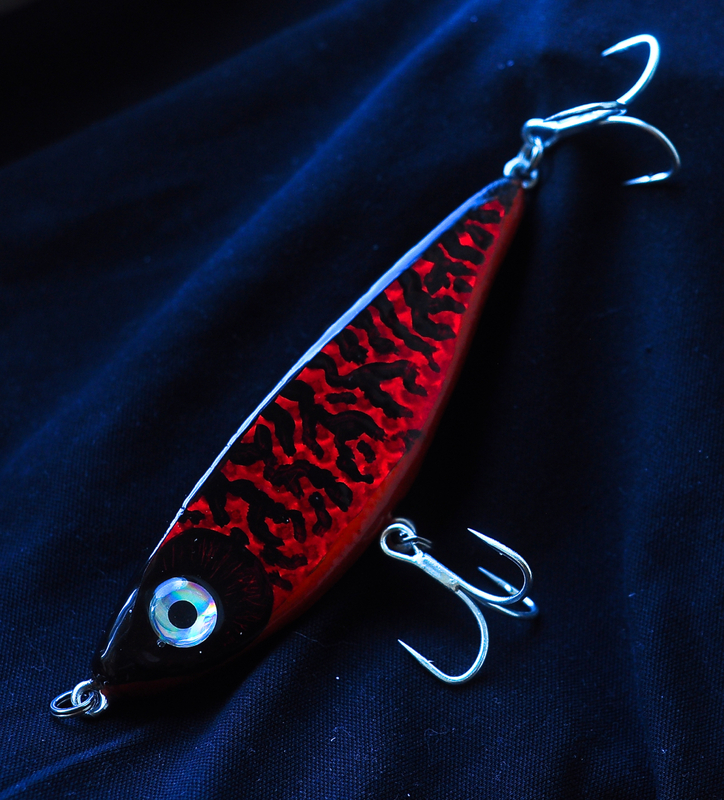 Small shallow running jerkbait, with red holographic foil over natural wood finish. Large slow sinking Jerkbait, red holographic foil, handpainted. 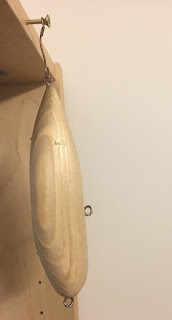 Finished with Owner treble hooks. 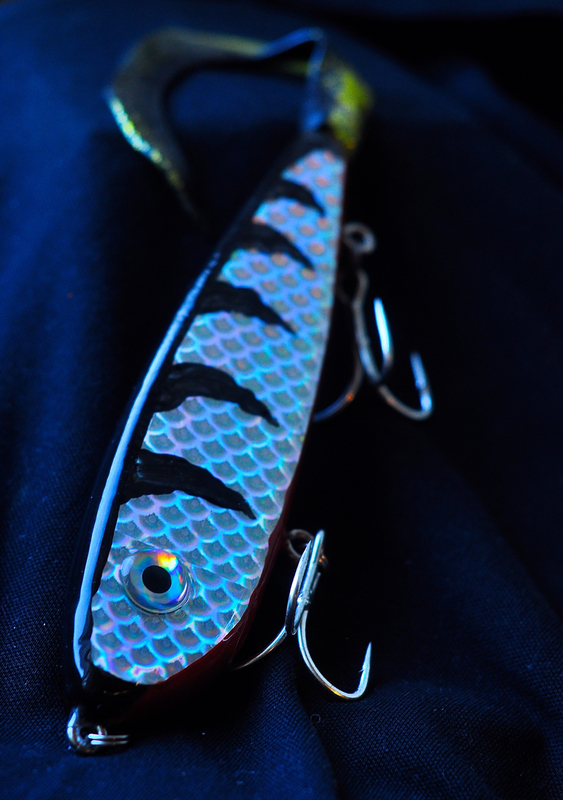 Large Tailbait for shallow water, made with silver holographic foil. 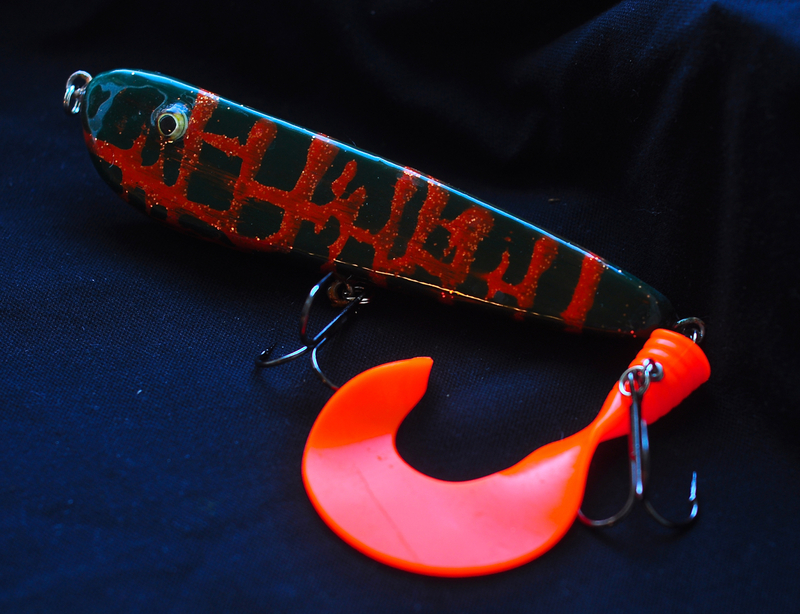 Screw on McMy Tail and Owner treble hooks. 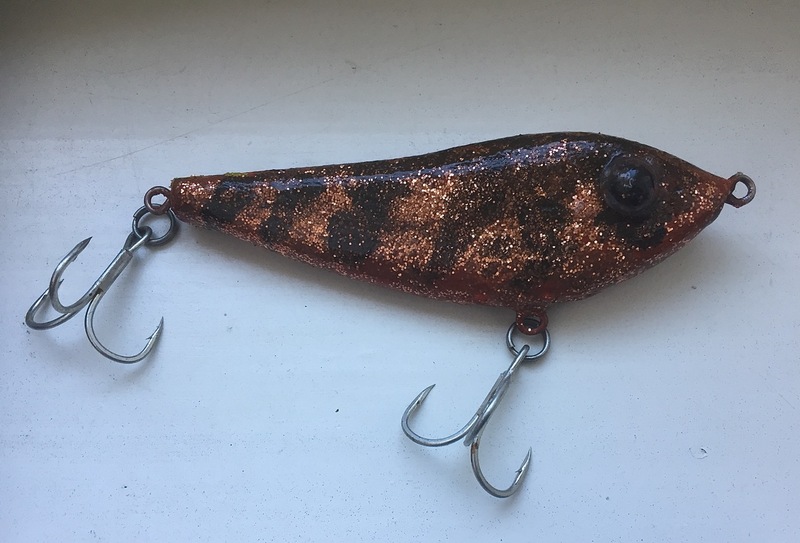 Medium slow singing tailbait made with brown holographic foil, handpainted and finished with a motoroil tail and Owner treble hooks. My first pike of the year was at Kyrkviken in Stockholm, a small fish, but most welcome. The day itself was frustrating as we saw many fish, though they were preoccupied with spawning and were not interested in our lures for the most part. A highlight of the year was the now annual trip to Dalälven, a superb location to fish for Pike and other species. 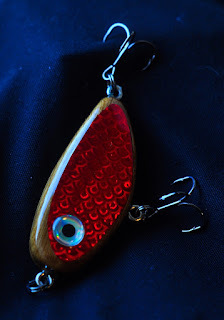 We spent three days on the water and had a great time lure fishing, catching good numbers of Pike as well. The area is one of stunning beauty and it is a wonderful experience to spend time in such a location. July was a month of searing hot weather and I spent a few weeks up north in Vasterbotten at that time. 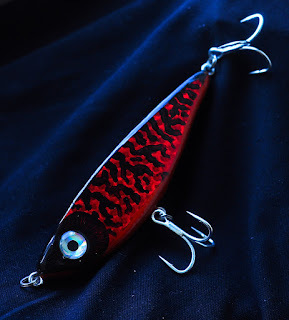 Fishing at the location of out summer cottage, I enjoyed fantastic sport with Pike on most evenings, with the fish hitting lures freely on most evenings. 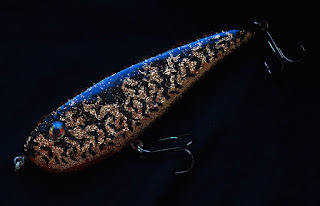 The fish in the area are not huge in summer, though they are present in good numbers and the sport is hectic at times. A few evenings were recorded with the GoPro cameras, with all four clips above assembled from footage shot during the visit. Tailbait, Mc Mio Tail and 1/0 Owner treble hooks fitted to handcarved oak body. Images here of the result of this winter efforts at lurebuilding. I learnt a lot from my first batch last year and this year I was able to produce a much better results using this knowledge and a few new power tools, notalbly a jigsaw and an electric disc sander. All of these are handcarved for oak, carefully weighted with tungsten. They were painted by hand using acrylic colour and copper glitter. The tailbaits were all finished off with McMio tails by Claes Svartzonker, whilst the hooks are all Owner trebles, which I have found to be strong and very reliable. 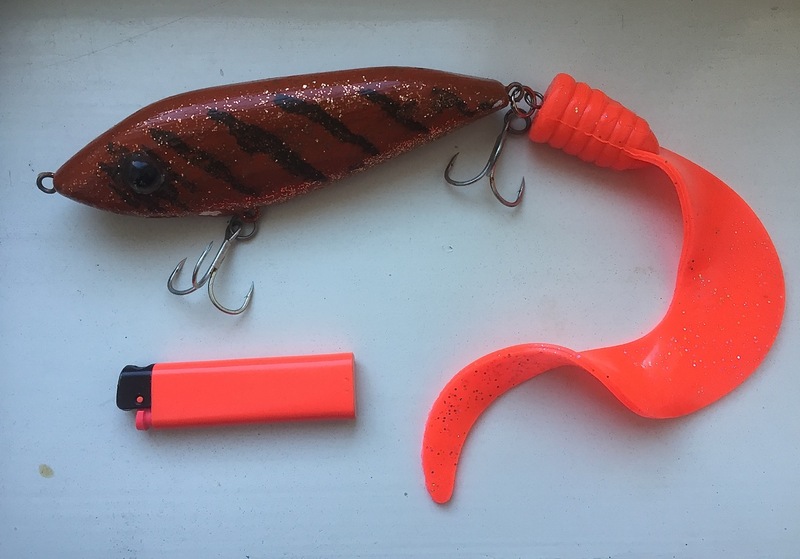 Looking forward to testing these out when the ice breaks up here in Stockholm, hopefully they will give me plenty of Pike. 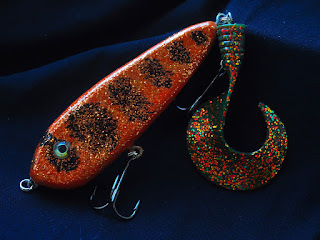 Having caught quite a few Pike on last years home made lures, I can say it really enhances the fishing experience to catch fish on a lure tht you have fashioned yourself. Hopefully these will bear the marks of Pike dentures before too long. Finally, after a cold, late winter the ice has finally cleared and the fishing season has begun. 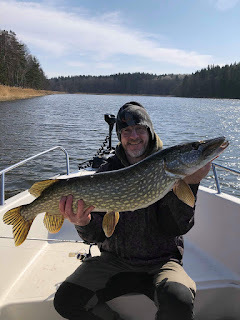 Eddie Bowler, Andy Shaw and myself got out over the weekend and spent the morning at a site out on the Stockholm Archipelago. A strong northwesterly wind made life very difficult however and we struggled as the steady breeze repeatedly pushed the boat out of position, making lure fishing very difficult. 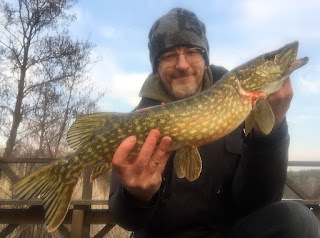 With just a single Perch of around a pound coming to my rod, we were soon forced to rethink our plans for the day..
A short video here of the only fish of the day, the first Pike of 2018. 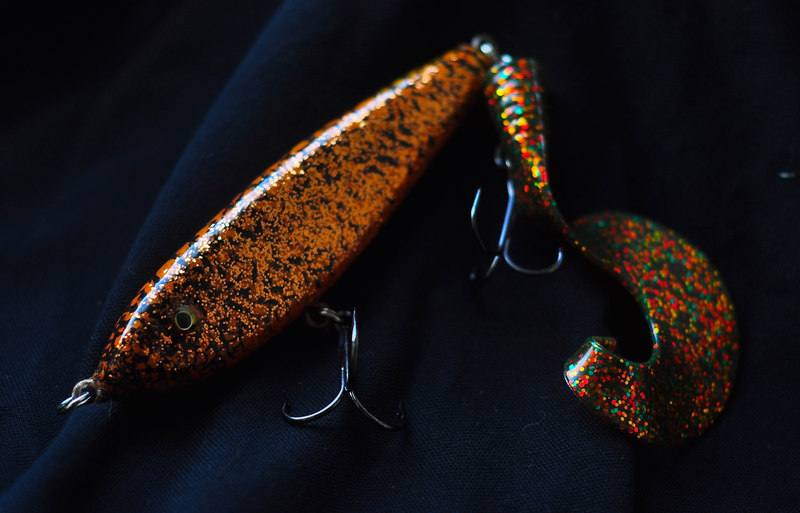 Lure 3. 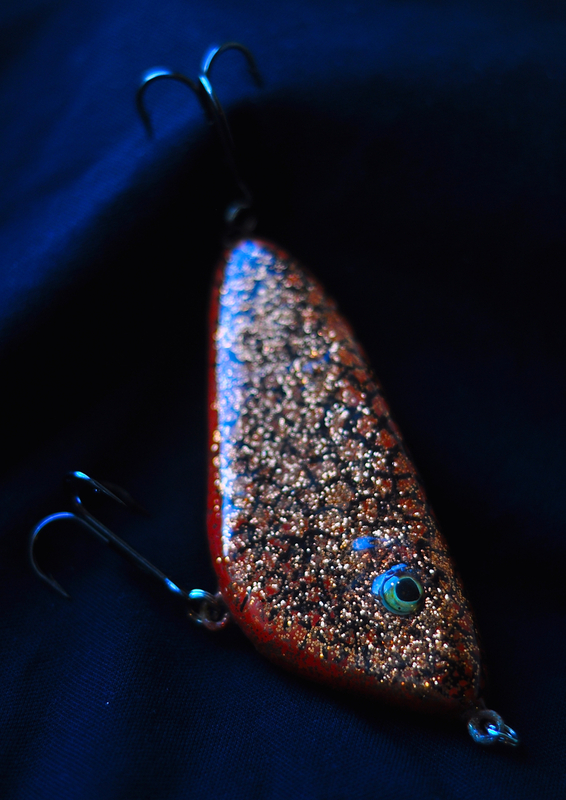 A simple glidebait, shallow running, with a little sparkle due to use of copper glitter over the paint.. 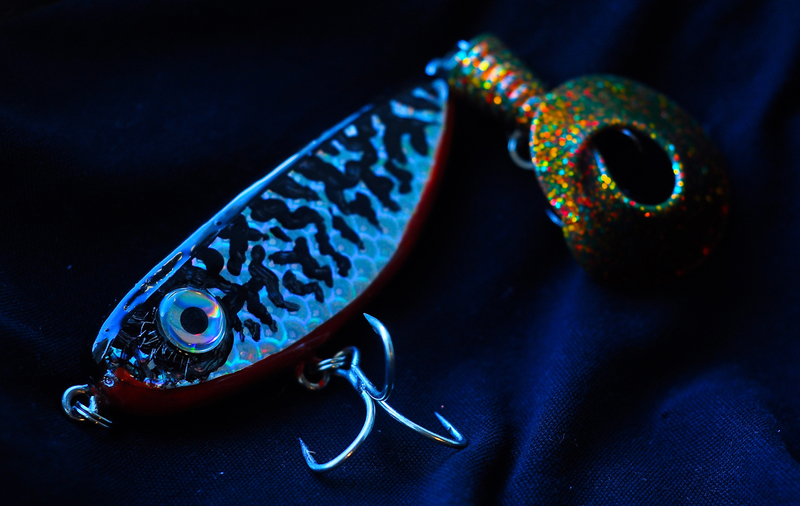 Lure 4. Yellow was a very good colour for me in 2017. This was handpainted with a little copper glitter sprinkled over the paint job. This lure can be fished as a tailbait, or if removed, as a simple glidebait. 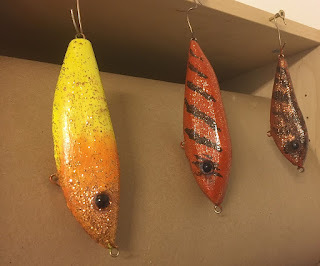 With winter stretching out rather late into the spring months, my thoughts have turned to fishing. 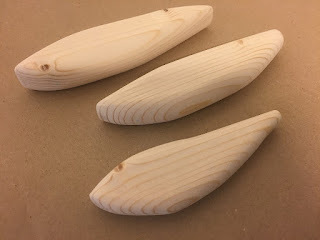 It has been frustrating waiting for this cold period to pass over and the waters around Stockholm remain frozen solid, so I decided to involve myself in a little project while waiting for spring to arrive. Building Pike lures is something that I have wanted to try for a few years, though never had the space to try it. 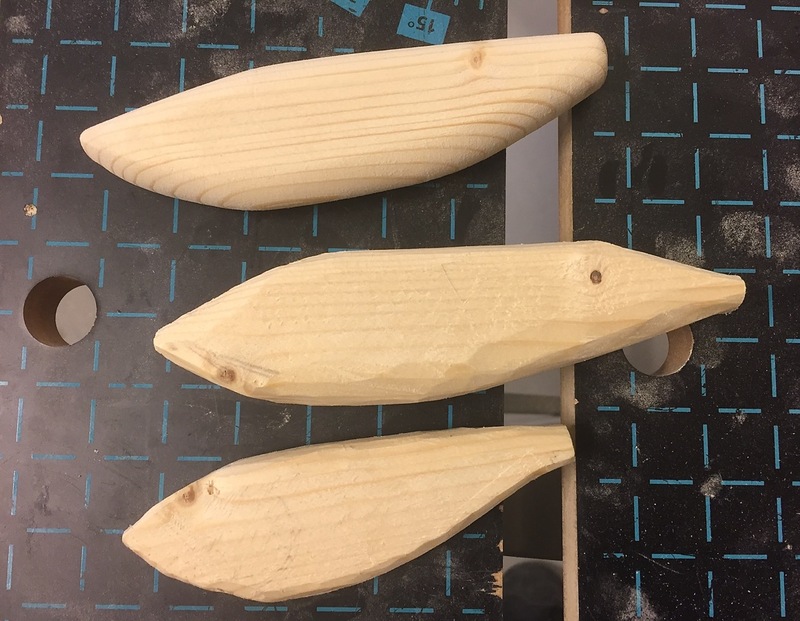 Having changed jobs and suddenly having access to a full range of woodworking tools it was time to try my hand at a few baits. 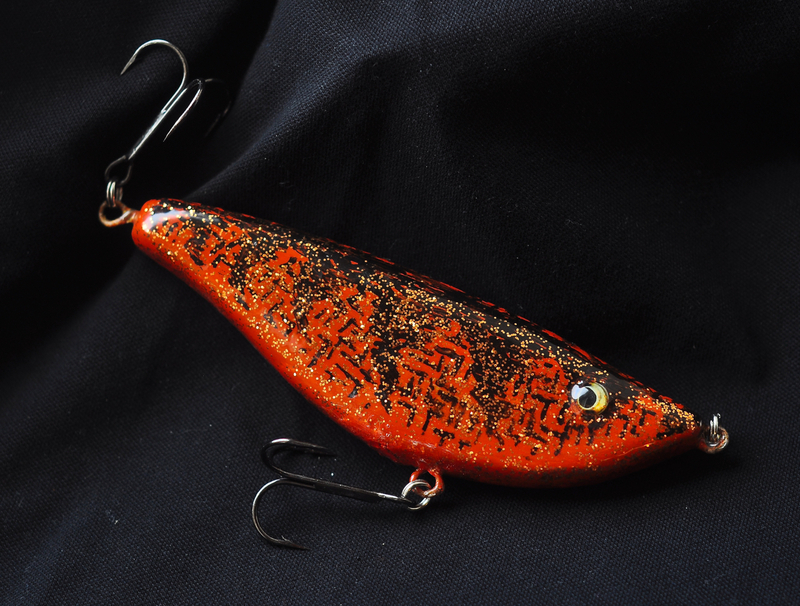 Late autumn is a classic time to fish for large Perch, one of my favourite species. It was decided to fish at Vaxholm, as the area had produced in the past. We began from the shore at an old favourite spot, legering redworms on the bottom. 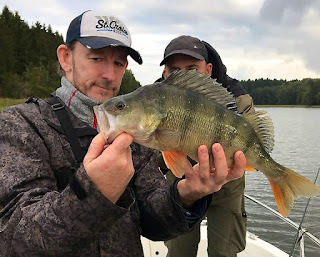 After a few hours later and we had only small fish and it was apparent that the large Perch were not in the area. 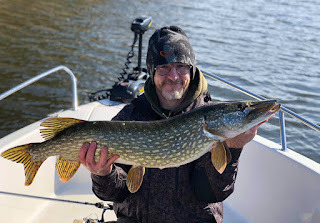 As a result, we were more than happy to board when Eddie Bowler arrived to pick us up in the boat to try fishing other areas with the jig rods. We made a few stops before moving to a favoured area for big Perch and all four of us casted towards the margins in the hope of a big specimen.. The first strike proved not to be a Perch at all, but a small Pike for Ed. 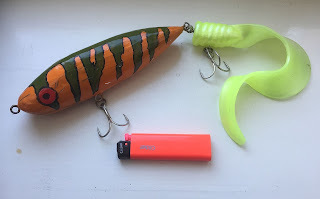 This began a rather remarkable five minutes for Ed, who had only just released his Pike when his yellow jig was hit again, this time the jagging motion was his rod tip suggested he was into a good Perch. 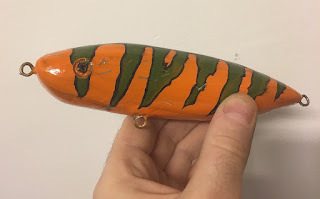 We all peered over the side of the boat and sure enough, as the fish came to the top, the tell tale green tiger stripes of a really good Perch flashed in the water and we duly netted the fish. 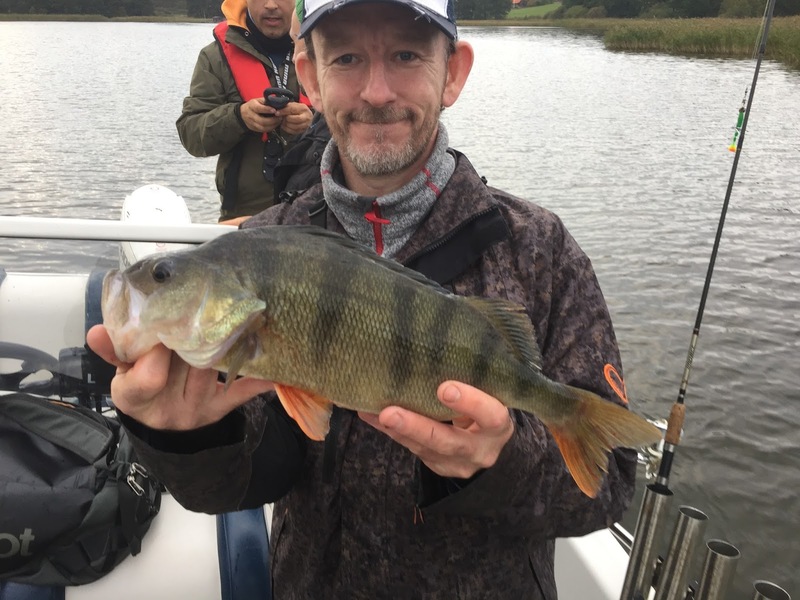 As Perch go, this was a stunner, easily a two pounder. 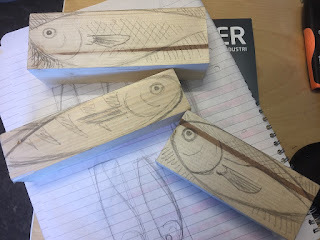 We took a little video for posterity and quickly released it and fished on. Not for long. 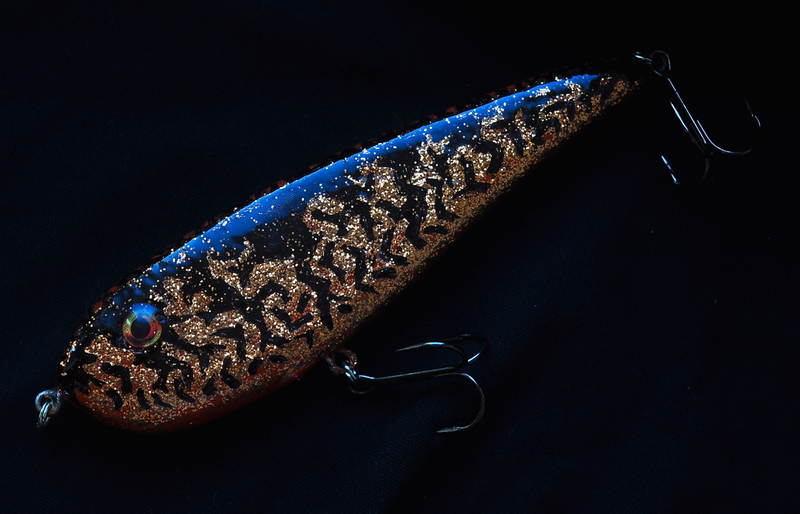 On his next cast, Eddie literally struck again, this time into a slightly longer, lean Pike. 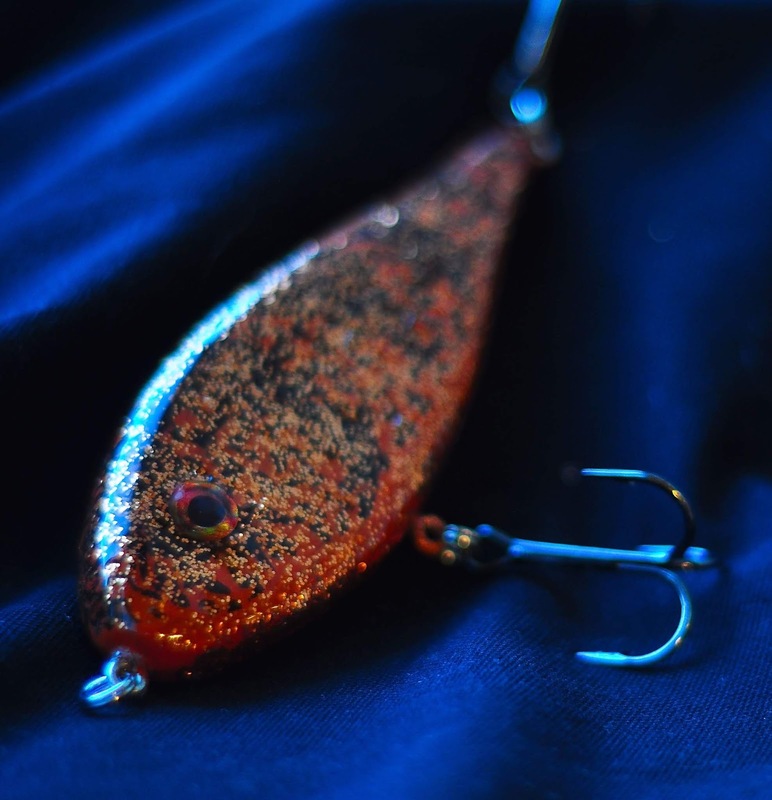 This fish fought harder on light gear before it was boated, unhooked and released.